Check out the latest cast image from the set of RESIDENT EVIL: RETRIBUTION. 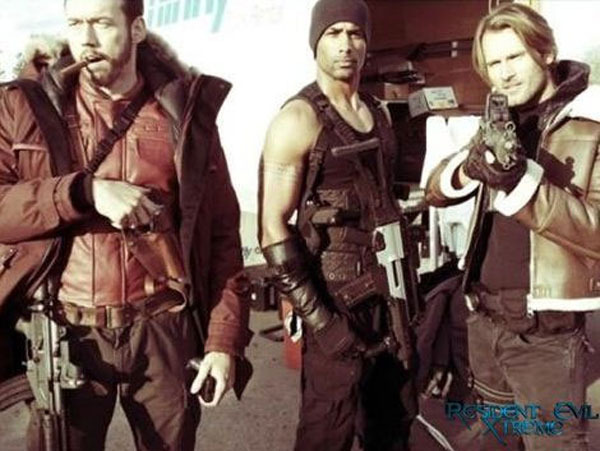 This pic shows us the trio of Kevin Durand as Barry Burton, Boris Kodjoe as Luther and Johann Urb as Leon Kennedy. These guys join Milla Jovovich, Shawn Roberts, Michelle Rodriguez, Sienna Guillory, Li Bingbing and Colin Salmon in the fifth installment that is written and directed by Paul W.S. Anderson. Resident Evil: Retribution hits theaters on September 14th, 2012.